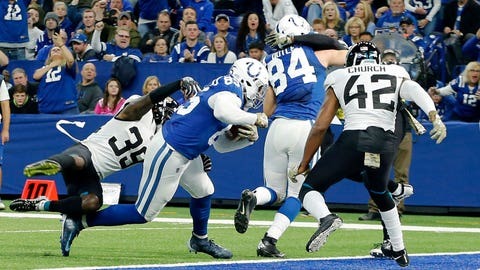 Colts tight end Eric Ebron, scoring his second touchdown of the game against the Jaguars earlier this month, has been one of Andrew Luck's favorite targets. JACKSONVILLE, Fla. — This season’s first AFC South rematch looks like a mismatch. The teams played three weeks ago, with the Colts winning 29-26 thanks partly to Jacksonville receiver Rashad Greene‘s fumble in field-goal range with 1:30 remaining. Coach Doug Marrone fired offensive coordinator Nathaniel Hackett and benched quarterback Blake Bortles this week, making two major changes in hopes of jump-starting one of the league’s worst passing attacks. He promoted quarterbacks coach and former CFL head coach Scott Milanovich to play-caller along with backup quarterback Cody Kessler. Kessler, who went 0-8 with Cleveland in 2016, will make his first start in two years. Jacksonville also will be without left guard Andrew Norwell (ankle), who became the third offensive line starter and fifth lineman to land on injured reserve. Eric Ebron already has 11 touchdown catches, matching his total from the previous four seasons combined, and he’s tied for the league lead with Antonio Brown and Tyreek Hill. In fact, Andrew Luck has thrown 18 of his 32 TD passes to tight ends — more than twice as many as any other team. The Jaguars are hoping to play a little cleaner. They lead the NFL with 22 personal fouls, and Marrone has grown tired of all the flags for undisciplined behavior. The biggest turnaround for Indy has come on the offensive line. The Colts have given up just 11 sacks all season, matching New Orleans for the league low heading into Week 13, and have allowed just one over the last six weeks.